Whether you are organizing an occasional event or a corporate event, Balloon decoration forms one of the best ways to turn your boring venue to an exciting one. One of the most curative ways of decorating balloons at an entrance point. If you are organizing a corporate event, you can surprise your employees, clients, and other social networks at the entrance point only. Make sure these arches are designed in a way to promote your company, brand, logo, and its products and services. In your corporate event or we call it corporate holiday fun party, you can consider using balloons as the table centerpiece of attraction. Balloon centerpieces are a good way of decorating your dinner lunch, or breakfast table so that your guests feel happy post-event. Create your company brand or logo on the balloon columns and try to place these columns at the most visited place. Your event is for refreshment but makes sure you want to add more clientele to your business as well. So, if you really want to make your event a hit, try to have fun and entertainment but along with this try to add some X-factor that can encourage more people to be a part of your team. Party means exchanging gifts for fun. If you invite someone to the corporate event, he or she may expect to get a return gift at the end of the day. For example, if it is an appraisal event and you want to surprise your employees in a way that they can never forget, tie a balloon to their official letter of appraisal and make their day more special. This is yet another great idea that can change your hall area to a completely new look. You can use some decent color tablecloths and multiple shades of balloons so that the balloon color goes in contrast with the tablecloth cover. 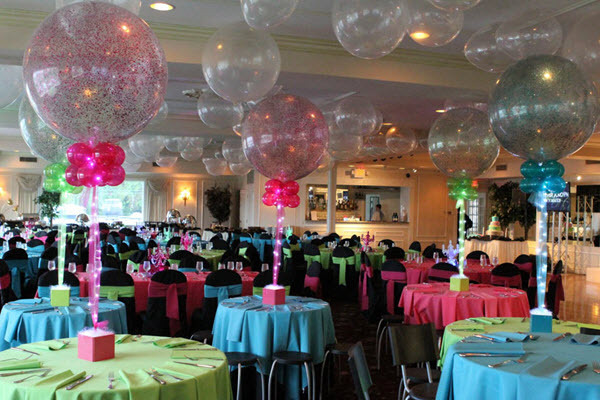 This combination of table covers and balloons really improvises your party looks and feel. Above are the simple and easy to implement balloon decorative ideas that can definitely turn your corporate event into a most memorable one. If you are looking for a brilliant corporate event and want to surprise everyone by throwing a grand event that no attendee can forget, then all of these ideas that we just gave above are best. You may find lots of balloon decoration ideas over the Internet but we have compiled this list of almost 5, after research and believe that it would be useful for you as well.